June 14 - June 20 - $699, Extra person $99/each, Upgrade to a type D larger two bedroom for $59. June 21 - June 27 - $749, Extra person $119/each, Upgrade to a type D larger two bedroom for $69. June 28 - July 15 - $1,099, Extra person $149/each, Upgrade to a type D larger two bedroom for $99. Aug. 23 - September 3 - $1,099, Extra person $149/each, Upgrade to a type D larger two bedroom for $99. The dates for this package are: June 14 to July 15 and August 23 to September 2, 2019. June 14 - June 20 - $999, Extra person $149/each, Upgrade to a type D larger two bedroom for $99. June 21 - June 27 - $1,199, Extra person $169/each, Upgrade to a type D larger two bedroom for $119. June 28 - July 15 - $1,699, Extra person $199/each, Upgrade to a type D larger two bedroom for $169. Aug. 23 - September 3 - $1,699, Extra person $199/each, Upgrade to a type D larger two bedroom for $169. Each bracelet also includes $10 worth of credits at Yippee’s Playcade. These passes are non-transferrable. An ID card will be issued on your first visit and must be presented upon arrival of each subsequent visit to receive admission for that day. Each bracelet also includes $10 worth of credits at Yippee's Playcade. Our beautiful pool and playground will round out a full week's worth of entertainment and relaxation. Plus the National Park and our beautiful beaches! Slide and Ride XL pass for a family. June 14 - June 20: $999, Upgrade to a type D bigger two bedroom cottage for just $99 for whole stay. June 21 - June 27: $1,399, Upgrade to a type D bigger two bedroom cottage for just $149 for whole stay. June 28 - August 24: $2,199, Upgrade to a type D bigger two bedroom cottage for just $299 for whole stay. August 25 - September 3: $1,699, Upgrade to a type D bigger two bedroom cottage for just $249 for whole stay. June 14 - June 20: $1,099, Upgrade to a type D bigger two bedroom cottage for just $99 for whole stay. June 21 - June 27: $1,399, Upgrade to a type D bigger two bedroom cottage for just $199 for whole stay. June 28 - August 24: $2,699, Upgrade to a type D bigger two bedroom cottage for just $359 for whole stay. August 25 - September 3: $1,999, Upgrade to a type D bigger two bedroom cottage for just $399 for whole stay. This is an answer to the “What do we do today?” question on the cooler, wet or overcast days. Each Poncho Pack will also include a $10 rechargeable gift card to Yippee’s Playcade at the Sunset Boardwalk. Attraction passes are valid for 7 days from first use, so families can pick and choose which days to use their passes! June 15 - June 27 - $499. June 28 - July 8 - $599. July 9 - August 24 - $699. August 25 - September 3 - $599. June 15 - June 27 - $599, Extra person $79/each, Upgrade to a type D larger two bedroom for $99. June 28 - July 8 - $799, Extra person $129/each, Upgrade to a type D larger two bedroom for $129. July 9 - August 24 - $899, Extra person $159/each, Upgrade to a type D larger two bedroom for $159. August 25 - September 3 - $799, Extra person $129/each, Upgrade to a type D larger two bedroom for $129. 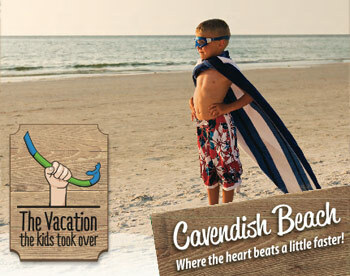 In 2019 hot season, we’ve combined a family day pass each to the two most popular Cavendish attractions with 3/5 nights in our 2-bedroom, family-size cottage to offer terrific vacation value even during the height of the summer season (Exclude July 5th, 6th, 7th). Your family of 4 will have day passes for Shining Waters Family Fun Park and Sandspit Amusement Park. More than 4 people? Just inquire with us. June 14 - June 20 - $499, Extra person $99/each, Upgrade to a type D larger two bedroom for $59. June 21 - June 27 - $649, Extra person $119/each, Upgrade to a type D larger two bedroom for $69. June 28 - August 24 - $999, Extra person $169/each, Upgrade to a type D larger two bedroom for $129~$299. Aug. 25 - September 3 - $949, Extra person $129/each, Upgrade to a type D larger two bedroom for $99~$299. June 15 - June 20 - $799, Extra person $129/each, Upgrade to a type D larger two bedroom for $89. June 21 - June 27 - $899, Extra person $149/each, Upgrade to a type D larger two bedroom for $99. June 28 - August 24 - $1,499, Extra person $199/each, Upgrade to a type D larger two bedroom for $169~$499. Aug. 25 - September 3 - $1,299, Extra person $169/each, Upgrade to a type D larger two bedroom for $129~$399. There is no better golf holiday destination than Cavendish Beach in 2018. 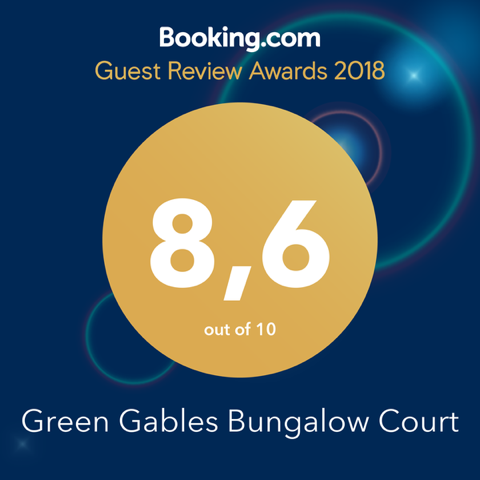 Here at Green Gables Bungalow Court, we're located next to the 18th tee of the beautiful Green Gables golf course, and just minutes away from three other championship 18-hole courses -- Anderson's Creek, Glasgow Hills and Eagles Glenn. We're sure you'll agree our cottages, location, and price will make your golf getaway destination an easy decision. Plus we can easily add more nights and more golf to suit your holiday (Exclude July 5th, 6th, 7th).